stashimi_frank added a comment to T3545: GpgOL: Support G Suite Sync Accounts. Better to fail loudly instead of silently breaking. stashimi_frank added a comment to T3424: GPG OL is crashing when sending message from a outlook profile created by gsuite tool. I use the Google Sync plugin to connect with our company Google Apps account. It also synchronizes the calendar entries as well as all other special stuff. I'm quite sure that the standard POP/IMAP mechanisms in Outlook might not deliver the sender's address (however the receipient's address is contained in the logs above - my googlemail.com address). stashimi_frank updated the task description for T3540: GPGOL crashes on Windows 10 / Outlook 2016.
stashimi_frank added a project to T3540: GPGOL crashes on Windows 10 / Outlook 2016: Bug Report. 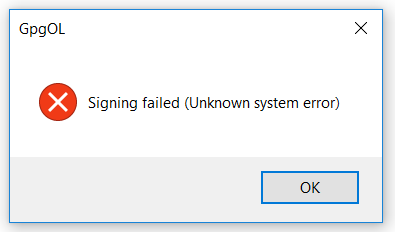 stashimi_frank created T3540: GPGOL crashes on Windows 10 / Outlook 2016 in the S1 Public space.